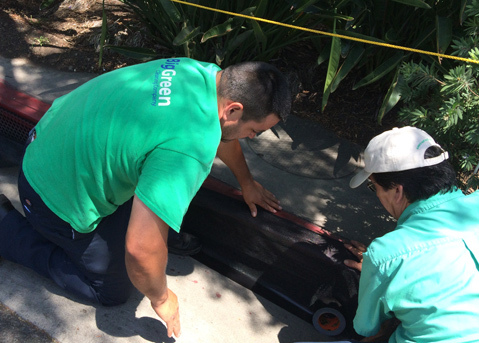 Juan Perez (left) and Roger Ayala of Big Green place silt mesh over State Street drain openings, part of the city's preparations for Old Spanish Days. Bicycle riders, food vendors, and cascarón waste come under special scrutiny this Fiesta. Parking rules on the street during the Fiesta parade, however, will relax in certain areas, as meter maids will give the 75- and 90-minute curb-parking zones in parts of downtown a break: Above the 101, parking for any length of time will be allowed on August 5 from 9 a.m.-6 p.m. up to Valerio Street and bordered by Bath and Laguna. Below the freeway, the zone goes to Cabrillo Boulevard and between Castillo and Garden. Food vendors proliferated about three Fiestas ago, said Sgt. Riley Harwood, of the Santa Barbara Police Department, leading to a check for required permits this year and last. Vendor permits are only one of the heightened concerns for law enforcement during Fiesta, Harwood indicated, others being lower State Street’s nightlife district assaults, DUIs, traffic, and property crimes. To keep those numbers down, law enforcement does gang sweeps and also makes contact with probationers for compliance. Saturday’s Fiesta Cruiser Ride is a two-wheeled worry all its own. “The degree of lawlessness we were seeing really heightened a concern for safety,” said Harwood of the homegrown ride between Santa Barbara and Goleta, peopled by about 1,200 cyclists in recent years. The violations police routinely see are the same that lead to fatalities, Harwood said: running stop signs and traffic signals, and failing to ride as close as practicable to the right-hand curb, all of which carry hefty fines. In addition, the Sheriff’s Office warns that construction ongoing at the Goleta Beach Park Bridge has caused detours in the constricted area. The bridge is being replaced, and cyclists are warned to watch out for the construction signs.